Discussion in 'F1 2018' started by GTPNewsWire, Aug 22, 2018. 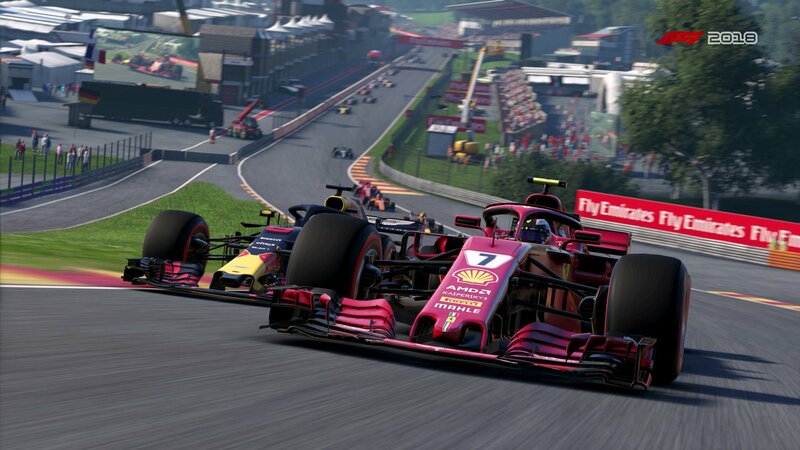 This article was published by Kyle Patrick (@SlipZtrEm) on August 22nd, 2018 in the F1 2018 category. alegunner68, glassjaw, Interstellar9 and 10 others like this. Great review Kyle! This really is getting universal praise. Looks like I will be picking it up. danimac, Jordan and SlipZtrEm like this. Thanks! It's deserved; I really believe the F1 games are fantastic overall packages, and this is the best yet. It's certainly an example of how focusing on one discipline in particular can result in a very strong product. I love me the sandbox games as well of course, so it also shows that there's quite a lot of range to be had in this genre. F1 has its niche, and it's knocking it out of the park. Imari, Interstellar9, Jordan and 2 others like this. Is the game worth picking up if I already have 2017? Read and you shall be enlightened! Yeah, I know that- I'm not too far into the game, is it worth waiting a while until I do better at the 2017 game? I suppose that depends on your priorities. If you want to take part in a lot of online racing, then I'd imagine the newer title would be the better option once it's out. However, the single-player campaign is a peach, and that isn't as time-sensitive. As expected, the entire current lineup of drivers, cars, teams, and circuits are here, plus four short tracks. What do we mean by plus four short tracks? Like fantasy tracks or shortened versions of tracks already in the game? Short ribbons, like Suzuka East. Bahrain (Paddock Circuit), Silverstone (International Circuit), Suzuka (East Course), and COTA (West Course). KepleroGT and TheGeologist like this. Are tracks like Malaysia that got removed from the calendar in recent years still in the game? (for free play, not career obviously) The track is in F1 2016 but I’m not sure if it was in F1 2017 or now 2018. Just out of curiosity, how much time did you have with the pre-release copy? I'm not disputing the review at all - let's face you could take 2017, put some halos on it and still end up with a AAA F1 game. And of course you wouldn't need to do anywhere near a full season to get a handle on the game, plus familiarity with 2017, and possibly 2016 before that, would enable you to drill down on the differences and improvements pretty quickly. Nevertheless I'm surprised at all of the reviews popping up today (which are all pretty much in agreement with each other) given that the depth of the game would require a pretty serious time investment to really get to grips with. KepleroGT, Sloppy Shades and HammyMansell like this. I always sell the predecessor before the successor is available. I can recommend it. Has some neat improvements to gameplay, presentation and content. Sometimes these are big things (I love classic cars, so I like it that there are even more), sometimes these are small things (new camera angles before a race, selectable head turning into the corner apex which makes it a lot easier and immersive to drive in cokcpit view). Overall it's worthy in my opinion but it's no revolution but a evolution. Malaysia is not part of the game. Sorry. I have the beta on PS4 and I’m really enjoying it, think they took the feel and realism much further than I was expecting this year. The sounds are better and the handling physics are good. So according to my Xbox I’ve already spent over two days playing (50h), but that’s not entirely accurate, since there was a bit of idle time! To explore the new aspects of the season, I cut down the time on all sessions. 30 minute practice, one-shot qualifying, and five-lap races. The wear and tear scale based on these settings, so I was still picking up grid penalties near the tail end of the calendar. I had done the first race of the season in a longer format for testing at first, but as you mention, it didn’t seem viable to explore the new features in time. I could’ve simply simulated sessions, but I wanted to spend as much time driving as I could. A certain level of familiarity with the previous editions probably does help, but the breadth of options for the gameplay makes it possible to experience more of the game at your own pace. FWIW, I hadn’t quite finished my first season before this published. But I did last night! Interstellar9, breyzipp and Slapped like this. As far as answering questions for the reporter goes. I feel like they should have at least 1 standard Kimi response for each question. So after reading Kyle's review last night I managed to pick the game up from CJS Keys for only £30, however, the keys are still not available. I've heard it's a 50GB download so no chance of me playing until after work tomorrow. Currently downloading - 43.214 GB according to my PS4 notifications - should be down in about 15 mins if it keeps up the current download rate. However I won't be playing until tomorrow morning - I have the day off tomorrow, but need sleep. Nice review, can you share your game and wheel ffb settings? Someone on the cm forums was complaining the fanatec on xbox was horrible. Getting hyped for this. Great review. Very thorough! I'll be picking this up on both PS4 Pro and XB1X (yes, that's ridiculous). But I tend to use my CSL Elite PS4 with PS4 games....the wheel support is simply better, even when using the same wheel/game combo on XB1X, as the reviewer did. No LED lights, the force feedback is different, and most importantly, you lose 4 wheel buttons on the Xbox versions of these games (Fanatec knows this...but says it is a Microsoft problem). Anyway, I will definitely be playing this a ton on pad on XB1X and wheel on PS4. Can't wait to start tonight! Unfortunately, that is true. The Fanatec wheel support on Xbox is not as good as PS4. See my comment above. I still think it is a huge positive to be able to use the same wheel on both PS4 and Xbox, but it would be really nice if they were more similar in terms of quality. For whatever reason, Microsoft doesn't play very nice with Fanatec's CSL Elite PS4 wheel....no LED lights, unable to use all the buttons, poorer force feedback implementation vs PS4, etc. Don't get me wrong, it's still a great wheel especially versus using a pad. But then when I play the same games on PS4 I notice the differences. Anyone enjoying this on a controller (PS4 for me)? I'm thinking about buying it as I'm really longing for a racing game with good AI races and I won't be able to use my wheel for most likely weeks to come. I tried the F1 2017 demo the other day and it seems to handle pretty smoothly with a controller. F1 2018 feels great with a controller. Only ever drive with no assists (no tc, abs, racing line) and use cockpit view with the halo visible and for me although it’s a little more challenging and less forgiving than F1 2017 was its still great fun and very rewarding in terms of the cars handling. Hopefully they'll fix it eventually, I've got it somewhere near for now anyway. Pc2 was similar before the last patch and now it's sublime. Thanks. I bought the game . I agree. I do like the wheel overall still, even on Xbox, it's just a bummer about the missing buttons. But, per Fanatec, the problem is Microsoft do not allow them to list the pedals (acceleration, brake, clutch) as separate inputs as they can do on PlayStation. Thus you are forced to use LT/RT from your wheel for gas/brake whereas on PS4 you can assign the L2/R2 buttons to other functions while gas/brake are separate inputs. Annoying because even on PS4 you have to skip some options in PC2 that some might want to manually control. On Xbox it is made much worse as you lose 4 buttons on top of that. Fanatec support told me they have spoken to Microsoft about it, but for whatever reason the XB1 OS doesn't allow the separate inputs, at least with the Fanatec SDK. Hopefully they work that out eventually. its a shame that Malaysia was dropped from the calendar this year.